* Apliqué is an overlay technique of soldering cut-out metal designs to a metal base. **Prices are indicative and depend on the current price of silver and on ring sizes. Shipping costs and US and Canadian tax rates excluded. ***Shipping costs excluded, Dutch BTW included. See the order guide for shipping costs. Migizi, the Bald Eagle, symbolizes courage and pre-knowledge and is therefore emblematic of leadership. The Anishinaabeg regard Migizi as a special messenger of GICHI-MANIDOO, the Great Spirit and Supreme Being of the Universe, and his feathers are animated by his strength, courage, and great vision. To receive an eagle feather of the bald eagle eagle is considered a great honor because it recognizes achievement and great acts or deeds. Another eagle spirit called Gimishoomisinaan Giniw, Our Golden Eagle Grandfather who is regarded as protector of Ziigwan, the spring time spirit, watches over all women, and particularly over women who are in new beginnings. The feathers of both Eagle Grandfathers are being looked upon as anami'ewin mizhinaweg, prayer carriers of messages and giving thanks. 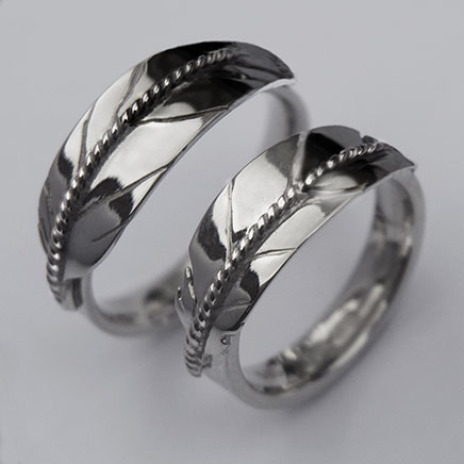 Like the smoke of the sacred asemaa (tobacco), eagle feathers have the power to convey our thoughts and feelings and provide us with an opportunity to speak directly to the spirits with debwewin (a straight mind) and bekide’ewin (a pure heart); hence the title of the above wedding ring set, "Spirit Reaching the Sky."